I turned in a travel story to STATravel monthly magazine. Lets hope I win and get published!! The hot Italian sun was beating down on us. My muscles were aching. I was constantly being pelted by chinese water tourture-like splashes of salt water, drying up and leaving me coated with a whitish crust. And you know what? I wanted more, and I never wanted it to end! Early that July morning, me and my fiance set out on kayaks to explore part of the east coast of Sardinia, between Calaganone and Cala Luna. It was an ominous start to the day. Over night, a huge ripping wind picked up over the coast, and we spend more of the night huddled in our small backpacking tent surrounded by the howling noises, wondering what was going on. When we woke up, it had subsided, but the water was still choppy, with some stronger gusts of wind here and there. But that was not going to deter us from exploring the coast that day. 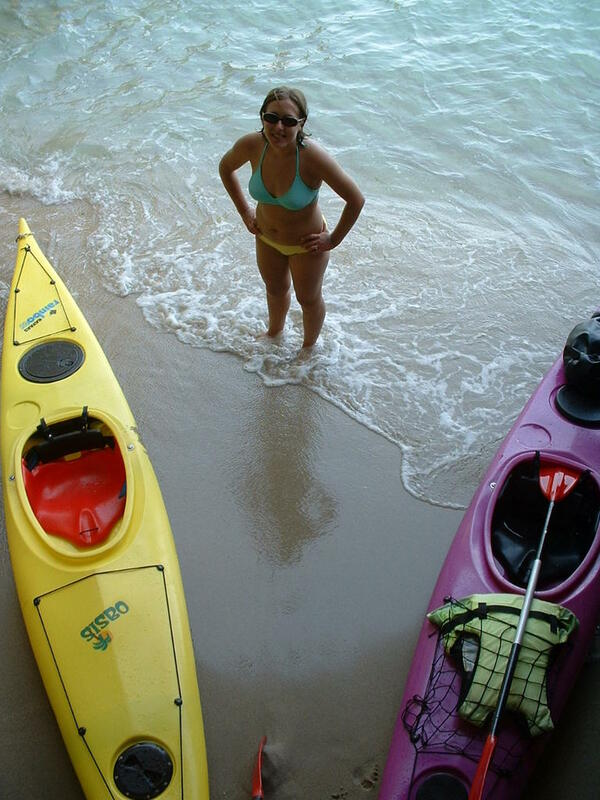 So off we went under the beautiful Sardinian sunshine, into our two neon colored kayaks, and onto the blue-green, pristine waters of the Mediteranean Sea.I had never kayaked in my life until that day. I was nervous, and the choppy-ness of the water kinda scared me, but I was absolutely not going to let this opportunity pass me by! I was amazed at the smooth cuts me and my kayak made through the water, and the quick speed we set off on. And right away, I felt so stable that any fear of tipping over just washed away in the waves of the sea. 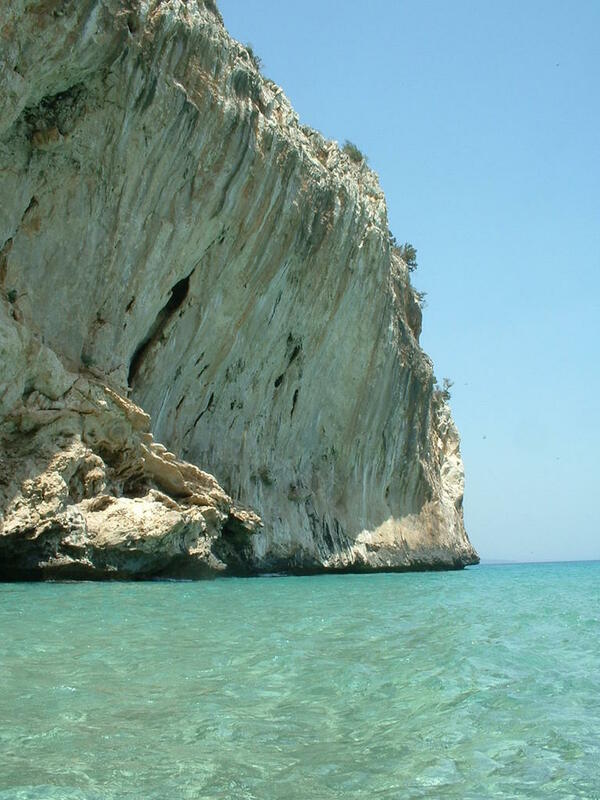 Right away, I was taken by the beauty of Sardinia's coastline as seen from the water. We paddled by huge cliffs, hundreds of feet high, with trees somehow growing out of bare rock, and clutching for life. Cliff birds sailed in and out and around us over head, calling and crying out. In the background, I heard the soft sound of the waves hitting the coast, carving out little niches and caves. Shortly into the trip, we steered out kayaks into one of these caves. It was an awesome feeling to float into it, through the huge mouth, and into the dark, cool, and spooky quiet inards. Our voices echoed against the cavern walls, as we were sealed from the outside world. We took a short rest to cool down, and to just reflect on the beauty. As we continued to paddle down the coast, heading south towards Cala Luna, we passed many wild beaches, formed because of the constant pounding of the the waves against softer rocks. They were almost hiden; you can only access them by a couple hours hike from the nearest town, or by boat. 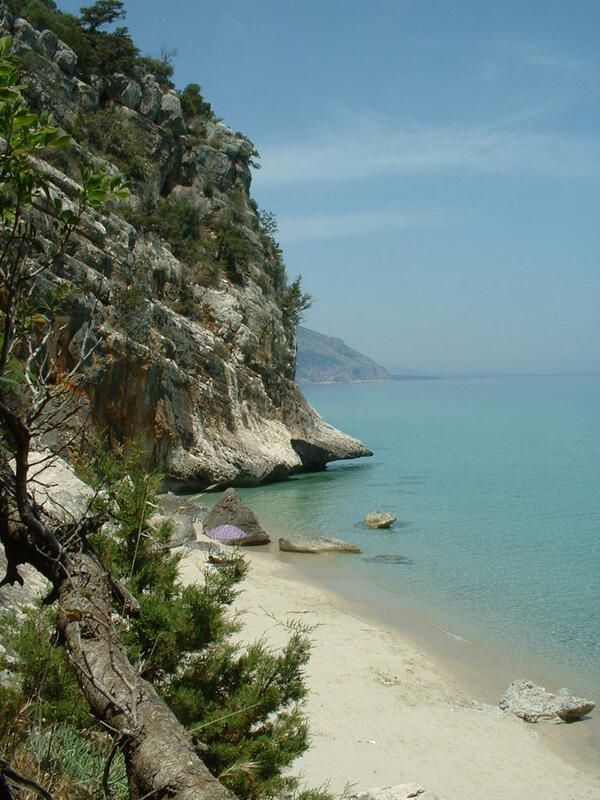 It was at one such beach, named Cala Oddoanna, that we stopped for lunch - Italian bread and Nutella (great lunch!). There was also a small cave here, which was just on land. It was so dark and scary though, we couldn't go in past a few meters. It was just too dark, and cold!! After swimming, and recharging, we paddled out again, my muscles aching. But that was no drawback. My arms kept paddling, and the pain was completely forgetten once we saw the next coastal formations to come. My jaw dropped as we paddled through the shallow, clear waters, past rocks with sea urchins and plants stuck under the surface. And we could see little fish swimming in schools all around. It was near by that we stopped at a very shallow inlet, when we discover what might be the smallest beach in the world! We called it "Cala Minibeach," and it was just the size for two kayaks, and two people to stand on it! It was afternoon when we reached our final destination, Cala Luna. Tired, we plopped on this big, moon shaped beach, and rested for a while. I was sad to think that we had to start heading back soon. That day was really a wild adventure!